Steve Edwards was born with a deformed left hand, was bullied throughout his childhood and has a congenital blood disorder that directly compromises athleticism. But none of that has stopped him becoming one of the world's most successful multi-marathon runners with over 700 of the fastest official marathon race times ever. Known in marathon circles as 'The Godfather', he is revered for his machine-like performances, running a marathon on average every 14 days in around 3:15 for almost 30 years. But who is the man inside the machine? What drives him to race a competitive marathon so frequently? To train daily, year after year, whilst working and maintaining a family home? Where does his dedication come from? How does he deal with injury, illness, varying weather conditions and the short recovery period between so many races? The Man Inside The Machine answers all the questions, and will warm and inspire runners and non-runners alike. Available from bookshops, Amazon and as an e-book. Pheidippides did it once and became a legend. Brian Mills has done it over 800 times…but you've probably never heard of him. He is a runner and ‘it' is the marathon – all 26 miles and 385 yards of it – and yes, Brian really has run 800 of them. He is also rumoured to have a butterfly tattoo for each one. But Brian is not the only one who has notched up three digits of gruelling athletic endeavour. The 100 Marathon Club, also known as the Hell's Angels of Running and Running Sluts (running one race whilst thinking of another) is growing in number every year. This is a club with no prejudices and only one prerequisite for membership – the completion of 100 marathons. It is full of colourful, contrasting characters with idiosyncratic personalities and diverse lifestyles. They make up a gargantuan melting pot of humanity linked by one common desire – to run… and run…and run. But who would want to run 100 marathons or more? Any why? How do they find the time, the money, the energy? Are they crazy? Find out by reading their stories. Some will make you laugh, others will make you cry, some may even inspire you to run a marathon. Believe it or not, these are ordinary, everyday people like you. Although when you have finished laughing and crying, you may still not be sure whether they are crazy or just passionate. But you – as they do when they run – will have a lot of fun along the way. A short, non-fiction, 6000-word story about an ordinary woman's remarkable achievement in the UK's toughest endurance running race, the Brathay-Windermere 10-in-10 (10 marathons in 10 days). Available from www.etherbooks.com or contact the author direct on seasidehelen@hotmail.co.uk. The book begins with a survey of the history of the 100 Marathon Club, the club for people who have run at least one hundred marathons. It quickly moves on to profiles of some of that club's members and, as you might expect, they're an interesting bunch, all with tales to tell. One of my favourites was the George Clooney lookalike who runs, at least partly, "for the beer." I learned that the Medoc marathon serves wine at refreshment stops, that there's a marathon at the north pole and that a chocolate eclair can be ideal pre-run fodder. There's lots to inform and entertain as the book recounts an incredible litany of achievement. A number of the runners profiled have run not just one, but several hundred marathons. Others have completed their centenary of marathons while coping with disability or serious illness. The author gives a real sense of just how inspirational these runners are, at the same time keeping the reader amused with her charming and witty style. An enjoyable read, whether you're a running fan or not. Hello!!! The book is super!!! I know of some people that are going to buy the book, this will be the first book ever that I'll read the whole way, thank you so much, did not think there was going to be that much written about me. Book arrived on Saturday just as I was setting off to drive to the Blackpool Marathon. All the usual suspects from the Club were there but it seems most had left before the book arrived. Obviously it became the centre of conversation. I feel the style you've chosen is appropriate to the subject matter. It's got a good blend of fact and humour as well as a sympathetic treatment of each runner, nicely personalised by your own asides and comments. Many many thanks for the book. You did a great job and it is a super read. You have a very nice writing style and you brought a lot of rather boring marathon runners to life. ! I wish you great success with it. Have read half the book so far, very enjoyable. All the best with it and I hope the sales are good for you. An enjoyable read, especially when you know some of the characters involved! Got my book this weekend, love the fun and human touch you have put into it GREAT! You made a great job about my fancy dresses. I have already read the book a few times, GREAT. Love it. The book is great, really enjoyable read and Teresa's enjoying it too. 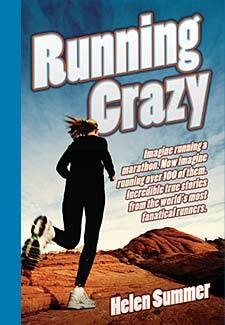 Half way through Running Crazy the book. Love it! I can genuinely give you a five star rating on your book. I've been reading it all weekend. Your book is a great read - really enjoying it and the way you've chosen to write it is excellent - I like how you get the facts across in an interesting and light-hearted way without losing any of the impact of the achievements of the runners. Brilliant innovative way of writing. I'll be buying the book as presents. Summer's Shorts - excellent! Such a terrific book. Many congratulations. Pete Simpson (on for his 200th Marathon in Limassol) likes your book - and somehow your sense of humour! Did you know that the last 2 races (near the finish) cheering on my runners, have seen me reflecting on the summary in your book – and twice it has brought a lump to my throat! One of my runners who came in this morning produced your book from his bag – John Clark – loves it! Congratulation! I knew you are a good athlete / runner and even a better coach .But I had no idea that you are such a talented writer .With your beautiful prose ,your power of imagination . and by attention to details , and above all your sense of humour,, you have brought to full life al the runners and the adventures in their lives. While I was flattered by what was about me in my chapter, I was ( quite rightly so ) humbled by the achievements of the likes of Roger Biggs, Brian Mills, and Ron Hill .There was a lesson for me from the experience of each of the runners in your book ( I only wish I knew them 20 years earlier !) Also against their colourful and fantastic adventures mine feels so pale. Imagine doing a marathon around the North Pole ! The number of places in the world I wanted to visit and have not managed so far (not to mention the places I have not even heard of !) Your book could act as a good source of motivation for anyone who wants to start marathoning , and if capable reach to 100 and beyond. One final remark. The experience of Chris Monsey in Addis Ababa marathon gave me the idea: It would be wonderful if they arrange shuttle services during the race in London marathon for those who want to have a faster time or even a PB. There aren't many books I describe as ‘must read' but this is one of them. Needing some inspiration to up my running regime, I found it in this book. Summer's writing style captures ably the various personalities involved in this remarkable collection of human endeavours – stories which have pushed me to get back out on the road and attempt to train to run at least one marathon. I loved it and am looking for other similar collections. I am a member of the 100 Marathon Club so I know most of the people and inevitably am fascinated by the accounts of how others have also got to 100 + marathons. But for a non-runner or non-marathoner? How boring must it be to spend 3 or 4 or 5 hours doing one run? How boring talking about doing it 100, 300, 500, even 700+ times? Surely it is quality not quantity that counts? Well, maybe, but in the hands of Helen's intuitive interviewing style and exceptional mock cynical humour, these stories become so alive, it is a book which is hard to put down. The sheer variety of the stories of how some people have arrived deliberately or in some cases almost accidentally at a (long service) pinnacle of athleticism is in itself inspirational. It shows how anyone (and that includes any reader which is why it is inspirational) has an amazing story to tell…in the hands of a good story teller. And judging by this book, Helen is an exceptionally good story teller. Whatever the heartache, struggle or sheer bloody mindedness behind each runner's story, the overwhelming emotion which Helen portrays is that life is fun…and funny. You do not have to be mad to run a marathon but it helps if you take a leaf out of Helen's book and don't take yourself too seriously. This is a great read for anyone – whether they like taking exercise, are marathon runners or are couch potatoes. I like the divers mix of stories told in a quirky, fun irreverent way that does not lose any of the impact of the level of achievements reached by such a wide range of persons – from the extrovert to the introvert and across those with disabilities and all ages. It is a fascinating, easy read for all and I recommend it whole-heartedly. As a person that has been running for 2 years and has completed 1 marathon, the thought of attempting to run 100 seems like a distant fantasy, until you read this book. It is filled with inspirational stories of ordinary people that pulled on their trainers and took to the streets for a variety of reasons and just kept going. Put across in a way that feels very personal these tales will have you engrossed and unable to put the book down. Indeed, I completed the book in only 6 evenings whilst in the bath post-training run. The only criticism I can level at this book is I was left wanting more (Helen Summer and publisher take note). Not only more tales from the 100 Club but more in depth about the people contained in this book, although I can see there could be many volumes so this would not be practical. Would it? Did it inspire me to aim at 100 marathons? Well, let's get to 10 and we will see! This book should be required reading for all sports lovers not just marathon runners. It should also be required reading in sports clubs world-wide and would be an entertaining read for anyone who wants to know about ordinary people who do very special things and succeed. For not only does it tell in easy to read yet beautiful prose the most delightful, witty stories about that very special breed of people – marathon runners – but about life itself. I received this book as a gift. Probably not the sort of book I would normally have bought for myself. What an extremely pleasant surprise it was. It is a cracking book, written with reacl style and humour and I found myself having “little giggles” on almost every page. I will definitely recommend this book to friends and family. A great book, easy to read, I finished it in just a few days. Even if you aren't a runner you cannot fail to be inspired by some of the people contained in the pages of this book. Helen tells the stories in a way that is engaging and fun. I have got a way to go before I reach 100 marathons, but this book does make me think that maybe I could do it and see all sorts of places in the process too. If you learn one thing from reading this, it is that watching the London Marathon could lead to all sots of crazy running in the future!! Choose your April viewing with care! Now, where did I put my trainers? I am a member of the 100 Marathon Club having run 145 marathons so far. I bought this book mainly to find out more about my fellow members. For example, I am one of Blind Paul's marathon guides but though he is constantly chatting as we run, I did not know he was not born blind, you just don't ask, do you… I have had 2 books published myself and was a little dubious about reading a book written by a non-marathon runner talking about marathons. I need not have worried as the author cleverly acted as a mirror to her subjects, showing surprise at feats we take for granted. As I am always on the run I like books with independent chapters so I can get to a conclusion then start again when I want. I recommend this book to runners and non-runners alike, it is a very enjoyable read.